1. In a medium glass bowl, prepare marinade by mixing together all marinade ingredients. Place fillets in a glass baking dish and pour marinade over salmon. Place in the refrigerator and let marinate for 1 hour (no longer), turning occasionally. Preheat oven to 375 degrees. 2. Place fillets in the center of a large piece of foil and pour marinade over them. Roll up the sides of the foil, closing it around the salmon. Place in a baking dish. Cook for 35 to 45 minutes or until fillet flakes with a fork. 3. Heat butter in a heavy saucepan until hot and foamy, but not browned. In a small bowl, whisk or beat egg yolks with lemon juice, salt, and cayenne pepper or hot sauce. Gradually beat in melted butter. Add water. Return mixture to saucepan and beat over very low heat until mixture is slightly thickened. 4. Pour water in the bottom of a frying pan and add the asparagus. Cover and steam 5-10 minutes (depending on the size of the asparagus). Once it is a bright green color, sauté in olive oil for about a minute. 5. 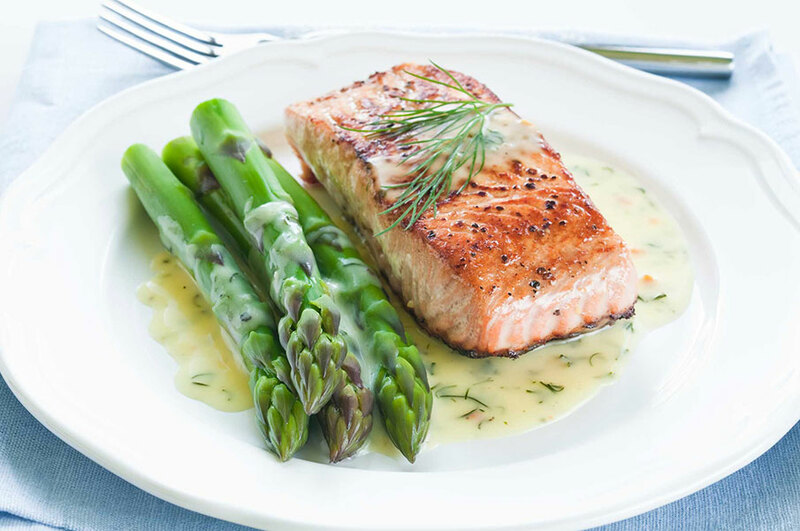 To serve, pour sauce on bottom of plate and top with salmon and asparagus. Sprinkle fish with fresh dill or parsley if desired. For more salmon recipes, visit MissHomemade.com.